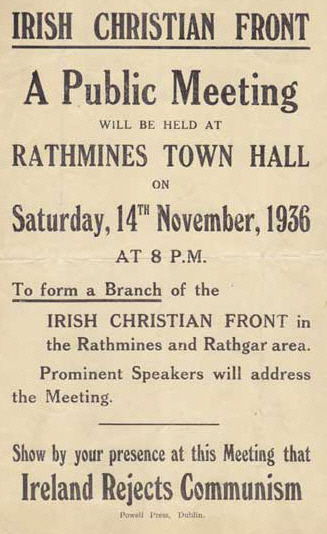 From 1936 a poster advertising a meeting to set up a branch of the Irish Christian Front in Rathmines Town Hall. ” Show by your presence at this meeting that Ireland Rejects Communism”. More information on The Irish Christian Front here and from here a brief description of their aims.. The aim of the Irish Christian Front is to organise a united Irish front of all those who are opposed to Communism and its allies in Ireland, for the creation of a social order worthy of the Christian professions, and to send medical aid and supplies to the patriot soldiers of Spain, and to assist the refugee victims of the Red government.